Never underestimate the comfort of a nice warm bottle. Your little one is screaming, but relaxes and settles down as soon as the bottle appears. It is as if bottles were the ultimate treat and comfort food. Well, for babies, they actually are. New moms often worry about the right temperature. Is it warm enough? Is it too cold? How do I know when it’s just right? With your bottle, you provide your baby with vital nutrition, while also giving them a sense of closeness and comfort. What’s more, feeding your baby a bottle is one of the most relaxing, happiness-inducing things in life. I’ve spoken to lots of moms and dads to find out which bottle warmers they prefer the most and combined it with my own experience of using several bottle warmers as a mother of two. Below, you’ll read about my take on six different bottle warmers, each offering something special for different needs. 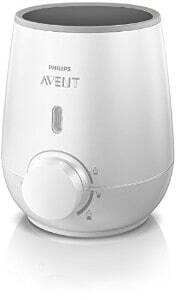 If you are looking for a fast bottle warmer, the Philips AVENT might be the go-to-choice. In only three minutes, bottles are heated to just the right temperature. Conveniently, you can also heat up food jars as well as defrost expressed breast milk that you’ve stored in the freezer. The AVENT circulates the milk during the warming up process, so you don’t have to ever worry about hot spots. Both the warming and defrosting options allow you to use this bottle warmer in a variety of ways. If your baby has moved onto solids, you can defrost jars of baby food. 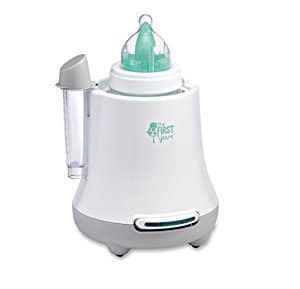 If you are breastfeeding and storing your milk in the freezer for times when you are away, your babysitter can easily defrost stored milk with the AVENT. Thankfully, this bottle warmer fits most types of bottles, not just AVENT bottles. It’s also quite stylish to look at and won’t take up too much space on your kitchen worktop. Also, the settings are easy to understand, making this machine easy to operate. The only downside is that this bottle warmer lacks auto shut-off – that is, it doesn’t shut off when the bottle has reached the chosen temperature. As a result, the quality of the milk begins to deteriorate, and you may end up having to make a fresh bottle. So, make sure that you keep a close eye on your bottles when they are in this warmer. What's Great About It: This easy-to-use bottle warmer heats 5 ounces of milk in about 3 minutes. There’s no need to fret about hot spots. It’s also small and stylish, so it should please you if you care about the looks of your baby gear. The Maxx Elite comes with a slew of different functions. For starters, you can gently heat four ounces of milk in approximately 9 to 10 minutes. The manufacturers have introduced the idea of heating the milk at 40°C, or 104°F, to preserve the nutrients that may otherwise get damaged at higher temperatures. The quality of formula milk or breast milk is therefore consistent, and your baby gets the best and most nutritious feed possible. Sometimes, you are going to forget to get the bottle ready. I have done that so many times. Whenever one of my babies woke up and didn’t have a bottle straight away, they used to get very upset. With this bottle warmer, your baby won’t have to wait. 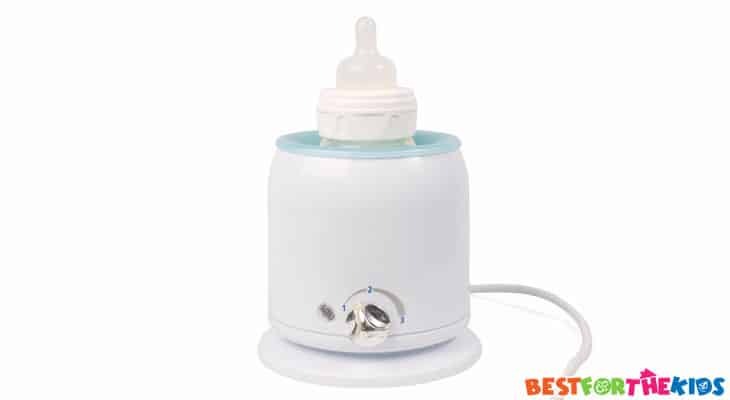 On the EXPRESS WARM setting, set at 70°C, or 158°F, you can warm your baby’s bottle in a few seconds. Do be careful when using this setting though, as the milk gets piping hot very quickly. The third function on the Maxx Elite is the STEADY WARM function. With this setting, you can keep your baby’s bottle at 40°C, or 104°F, for up to four hours. This is very convenient, especially for night feeds. Finally, you can also sterilize bottles at 100°C, or 212°F, so this is more than just an ordinary bottle warmer. The design is unique and compact, and using this bottle warmer is child’s play. If your priority is maintaining a high feeding quality, this might be a great choice for you. What's Great About It: I was most impressed with the low temperature heating process to preserve the integrity of the nutrients. The fact that there are different temperature settings to choose from, and it can also sterilize bottles, makes it a good choice. Unlike some other bottle warmers, many types of bottles and jars fit into this one. This device is quite different from any ordinary bottle warmer. It doesn’t plug in, but instead features a thermal flask which you fill with hot water. I really liked this bottle warmer because it’s so convenient for traveling. When you are traveling, you can use hot water to heat your baby’s bottles or food jars. Even if you are on the road for an entire day, it will do the job perfectly because you can refill it with hot water when necessary. 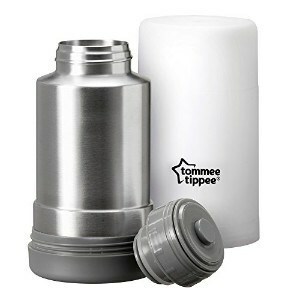 Before you set off on your trip, you fill the stainless-steel flask with hot water. When the time comes to heat a bottle, pour hot water from the flask into the container that comes with the flask. Simply place the bottle into the water and wait until it's heated up. This low-tech bottle warmer is rather stylish and small enough to fit into any nappy bag. The lids are ultra-tight, so you don’t have to worry about any spillages or leakages. All of the plastics used are BPA and phthalates-free. No doubt, this might be perfect for on-the-go feeding times and is also a fuss-free solution to any on-the-move bottle heating challenges. What's Great About It: This no-power bottle warmer is small and stylish, allowing you to heat bottles on the go. It’s a simple, but effective solution to your baby’s travel feeding needs. This compact bottle warmer warms the bottles slowly in a warm water bath rather than using steam. As a result, the heating process is gentler, which is beneficial in preserving the valuable nutrients. Still, this bottle warmer heats the milk quickly. Conveniently, it takes all types of bottles, even glass bottles or metal jars. You can also pop bags of pre-cooked frozen baby food into this bottle warmer. Within a few minutes, your baby food will be ready for your hungry little monster to eat. The manufacturers of this bottle warmer have put safety first. To begin with, this is the only bottle warmer that is designed with CDC (Center for Disease Control) and the USDA (United States Department of Agriculture) guidelines in mind. This is particularly important when it comes to maintaining the goodness and nutritional value of breast milk during the heating process. I couldn’t find much wrong with this bottle warmer and liked the safety features as well as the slow heating function very much. Perhaps the only drawback was that it’s quite difficult to clean, in the rare event when milk accidentally mixes with the water inside the bottle warmer. What's Great about it: The automatic shut-off is great and so are the slow heating and defrost functions. It’s also compatible with almost all types of jars and bottles. This bottle warmer is super-convenient if you are visiting family or going on vacation. It’s small and compact enough to fit into any suitcase, and wherever you are, it will heat your baby’s bottles to the perfect temperature. Within 5 to 8 minutes, you can heat 8 ounces of milk at the 40°C (104°F) setting. 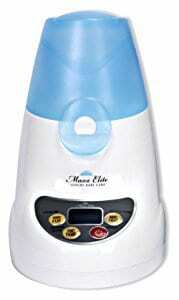 The bottle warmer also has a quick heating function with its 70°C (158°F) temperature setting. 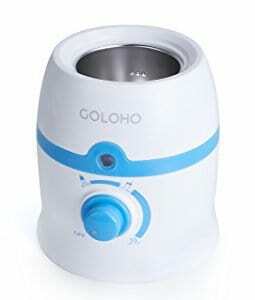 The Goholo bottle warmer heats the milk using hot water. You insert the bottle into the bottle warmer and add hot water, choose the desired temperature setting, and, within minutes, the bottle will be ready. The only disadvantage I found was that it doesn’t fit the popular Tommee Tippee or Comotomo bottles. But this is a minor negative, as there are many other bottles from other brands that it does fit. What's Great About It: This bottle warmer is super-portable and yet still delivers all of the functions that you’d expect. It’s easy to transport, use and clean. Don’t be misled by the rather low price of this bottle warmer because it does a great job and is extremely user-friendly. All you need to do is to add a small amount of water, place the bottle into the warmer, set the temperature and wait for the light to go off. Because you are only adding a small amount of water, you’ll have to do this before every use. This can be a bit of a nuisance, especially for night-time feeds, but you will quickly get used to the process. 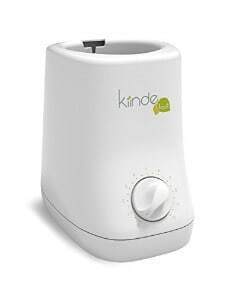 This bottle warmer has an automatic shut-off function, which is very convenient for busy moms. It takes many different types of bottles as well as food jars. Plus, you can use it to sterilize pacifiers. The First Years Quick Serve is stylish and will look good on your worktop. Moreover, the easy-to-follow instructions that come with the product tell you exactly what you need to do and how to make the best use of it. What's Great About It: Even though this bottle warmer is inexpensive, it ticks all the right boxes. It’s small and stylish, easy to use, and the automatic shut-off adds to the convenience. Some people may tell you that you don’t need a bottle warmer at all. Instead, you can just as easily heat up your baby’s bottle in the microwave or by placing it into a hot water bath. I personally won’t recommend you to do either of those. You probably know from experience that microwaves heat food and drinks in somewhat of an inconsistent way. Some of the food is scalding while the rest of it may still be quite cold. You simply can’t take chances with your baby’s milk. Hot spots can be dangerous and may burn your little baby's mouth. As for using hot water - well, the trouble is that you just never know if you’ve managed to make the water reach the right temperature. As a mom, you have enough to worry about other than having to fret over the temperature of your baby’s milk. So, do yourself a favor and invest in a bottle warmer - you won't regret it. Let’s look at the most important aspects to consider when choosing a bottle warmer. Before you purchase your bottle warmer, you need to determine which way you are mostly going to be using it. Do you need it on the go? Do you want to heat baby food in it? Do you need a “keep warm” setting? Do style and size matter to you? All of these bottle warmers meet certain needs, and your best bet is to list your priorities first and then choose a bottle warmer accordingly. Multifunctional: If you are using it at home, you may want to get a bottle warmer that is versatile and can also heat food and defrost frozen milk. Reasonably compact: You are bound to be going on vacation at some point and will want to take it with you, so it will need to fit in your bag. Bottle warmers are a must-have gadget for moms and dads. They are not just convenient, but also make life a lot easier for you and your little one. You can rely on them for getting the right temperature, and you won't have to worry about giving your baby milk that’s either too cold or too warm. Parenting can be overwhelming at times, so gadgets like a bottle warmer are undoubtedly worth buying. If you can get multiple functions from a bottle warmer, that is even better. When choosing a bottle warmer, identify your needs and choose one within your budget that comes close to matching most of them. All of the above bottle warmers deliver the basic function with each providing something a little different in addition to that.